Customers at about 2,500 Starbucks locations across mainland China can now make mobile payments using Chinese internet giant Tencent’s WeChat Pay mobile payments platform by scanning a QR code at the point of sale. 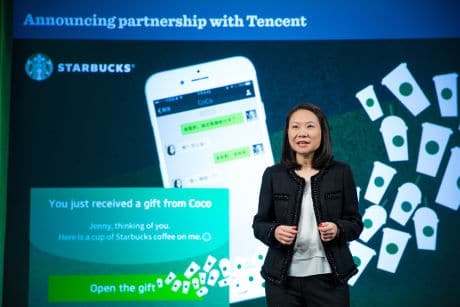 The two companies have also launched a social gifting platform allowing WeChat users to give Starbucks gifts to friends, who can save gifts on their WeChat accounts and redeem them at Starbucks outlets. “Jointly created by Starbucks and WeChat, the social gifting feature encourages everyday acts of kindness and appreciation among family and friends,” Starbucks says. “Customers will be able to select from Starbucks-branded gifts and products and add a personalised message of love, of gratitude or to simply uplift someone’s day. “Recipients can save their gifts and memories on their WeChat accounts and redeem their gift at Starbucks stores across China. As part of this partnership, Starbucks will introduce the use of WeChat Pay for purchases in its retail stores. “This new strategic partnership will leverage the strengths of both Starbucks and WeChat to create a true online-to-offline social gifting platform that will deepen our engagement with our customers in a unique and powerful way,” says Belinda Wong, CEO of Starbucks China. Starbucks launched its own mobile payments service across China in July 2016. Mobile payments now account for 25% of all transactions processed in Starbucks stores across the US, the company’s COO Kevin Johnson revealed during the coffee giant’s fourth quarter earnings call in November 2016. Starbucks continues to lead the way. They will offer to take your money in whatever way you prefer. In my local Starbucks one can pay using mag-stripe, EMV chips, bar codes, QR tags, or bar codes. Oops, I almost forgot; they also accept coin and currency. I expect than when facial and speaker recognition are deployed at the point of sale, I will see it first at Starbucks.